Here we go. 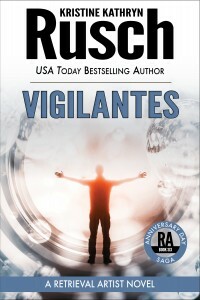 Vigilantes, which is the sixth book in the Anniversary Day Saga, appeared today. And with it, we begin what I call when I’m writing a book (or a story or a long story like this one), “the slide to the end.” Yep, things are changing, and the story you thought you were reading might not be the story you were reading at all. Cue evil chuckle here. Because I know what awaits you, not just in this book, but in the remaining two. You can now get Vigilantes on all online retailers and in all brick-and-mortar stores. If your favorite brick-and-mortar store isn’t carrying the book, ask them to order it. They’ll be able to get it quickly. So those of you waiting for the trade paper, you can get it now. And those of you who wanted the book on Nook, it’s there too. Yep, I’m having fun. I hope you are as well. « Masterminds Available for Preorder!